Levan Shonia is legend. Ever want to punch your boss, teacher, parent, or a person in power? Well you can’t do that you psycho but Levan Shonia is not like the rest of us. Over the weekend the 15-12 pro boxer fighting out Ukraine was tired of all the BS and did something about it. When life gives Levan lemonades, he punches the hell out of them. Shonia actually threw hands at one of his coaches lol. No, time to talk it over or game plan, just start punching your coach if you don’t like advice. 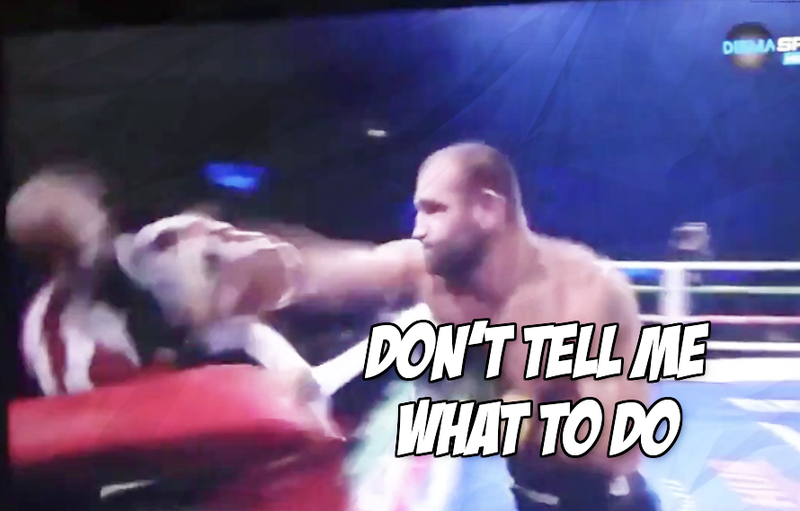 Nobody tells Levan Shonia what to do and we kind of respect of that. After Levan lost a decision to Spas Genov, the 34-year-old fighter thought the fight had more rounds to go. He still wanted to fight but the match was over. Maybe he lost track of time? Maybe his coaches are dumb and deserve a few punches to the dome? The ref stops the fight but our hero still wants to go at it. First, he tries to square up with Spas and when that fails he starts punching his coach. This would be great but instead of throwing one punch, Shonia throws a combo. Then instead of chalking it up to one big misunderstanding, our dude doubles down and chases his coach out of the ring. Once on the ring apron, Shonia throws more punches at his coach. Got to love his commitment to the whole “coach punching” gimmick. The next time some boxing writer disses MMA or brings up UFC 229, just remember, at least our fighters have yet to try and KO their own coaching staff.